Dr. Shirley Childress, known as the “Mother of Songs Sung”, worked tirelessly as an interpreter and advocate for the Deaf community. Shirley was born in 1947 to Herbert and Thomasina Childress in Washington D.C. Her father,Herbert became deaf at 6 years old from spinal meningitis. He attended the Tennessee School for the Colored Deaf and Dumb in Knoxville. According to an article in the Democrat & Chronicle, “he became the first deaf African-American in D.C., to build his own home in 1947. It included a bathroom — something not all the neighbors’ homes possessed — and electricity, but had neither phone nor television. When someone rang the doorbell, lights flashed to alert Childress Brown’s parents.” Shirley’s mother, Thomasina was born deaf and attended the North Carolina State School for the Deaf and Blind in Raleigh. She became one of the first deaf African- American teachers at that school upon graduation. Shirley was the middle child; her older sister Maxine and younger sister Khaula are also codas. Growing up her family primarily used Black American Sign Language in their household..
After graduating from the University of Massachusetts in Amherst with a BA degree in deaf education, Shirley received her certification from Registry of Interpreters of the Deaf, Inc (RID) in 1977 and began her professional interpreting career. Although Shirley worked in various interpreting situations, she received the most acclaim for her work in performance interpreting. Starting with her mother, music was a staple of the Childress upbringing. According to a quote from Shirley in The Washington Post, Thomasina Childress sang with the choir of the Shiloh Baptist Church and signed for the deaf members who called themselves the Silent Mission. “We didn’t have a record player at home, so singing in sign at church was probably our first exposure to song,” Dr. Khaula Murtadha, Shirley’s sister, says in an interview for the New York Times. 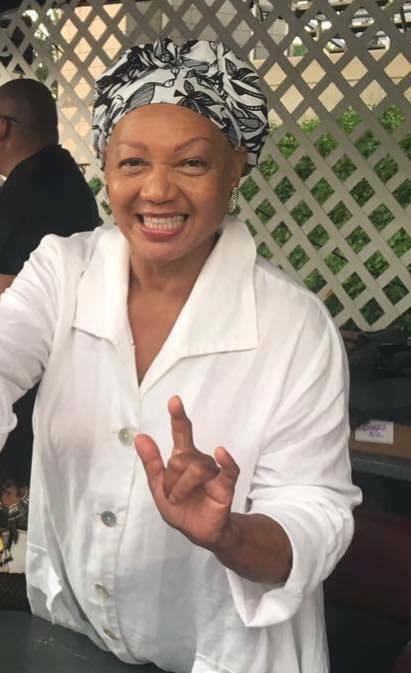 Shirley was introduced to the world of performance interpreting while working at an assignment where she met another interpreter, Ysaye Barnwell, who shared with her information about musical group Sweet Honey in the Rock. Shirley joined the group soon after and for the next 30 years spent her time travelling, performing and breaking barriers for deaf audience members. Typically during musical shows interpreters are often placed to the side of the stage. Shirley however took a different approach and placed herself within the semicircle with the group and performed right along with them. “Shirley opened the door for many deaf people to have access to your music. It also opened the door about giving language equivalent to the deaf where music is concerned. Her work is not forgotten but I see it in other music venues by interpreters who saw her work. God is lucky to have her signing in his/her presence.” stated a fan of Sweet Honey on their facebook page. All of her work culminated in earning a honorary doctorate from Chicago Theological Seminary. Shirley’s accomplishments in the interpreting field were matched by her advocacy work in the deaf community. She was one of the founding members of the National Black Deaf Advocates (NBDA), and worked with Deaf Pride’s Project Access in cooperation with the Child Development Center at Howard University giving deaf women important access to maternal and child health services. Also heavily involved in growing the interpreting community, she also founded the organization BRIDGES, to focus on meeting the needs of the black deaf community and interpreters. Shirley went on to teach sign language to the staff of a state school for the mentally challenged in Belchertown, MA. and lent her expertise and experience by teaching at the interpreter training program at Gallaudet College. Looking back on her upbringing, Shirley stated in an interview with The Washington Post, “Although my parents were both deaf, I don’t feel disadvantaged. My father was president of the deaf club and my mother has always been active in the church. Before coming to Washington, she taught kindergarten at the North Carolina School for the Deaf and Blind, from which she had graduated.” In memory of her parents, she established the Herbert and Thomasina Childress Scholarship Fund to help children of deaf adults (CODAs ) interested in pursuing interpreting as a career. Shirley passed away on March 6, 2017 at the age of 69. With the many accomplishments she has achieved she is not only leaving behind a legacy of advocacy for the deaf community, but an imprint on the interpreting world. In her honor, the development office at Gallaudet University set up the Shirley Childress fund for interpreting students of color at Gallaudet. To give to this fund and to honor her work, visit the donation page.